Some advertising tropes die hard: women directors, regardless of their talent and creative prowess, are still rarely give the chance to tackle automotive and sports projects. B-Reel Films Scandinavia director Lina Söderström‘s latest work for Volvo‘s Number 10 scholarship fund, created with agency Animal, brilliantly tackles both fields in a single spot. Bolstered by gorgeous camerawork and true-to-life portrayals of athletes, Lina’s vision creates a truly cinematic piece of short-form storytelling. With this in mind, how much incredible work are we missing out on when women directors are only given a limited selection of genres to explore in advertising? We spoke with Lina about her approach to lighting and capturing action-packed shots, her strategies for tapping into naturalistic performances from her actors, and the importance of seeking out jobs that you can truly feel passionate about. This spot for Volvo is wonderfully cinematic. What was the initial idea, when it was presented to you, and how did you imagine bringing it to life? When I get a script, I usually sit by myself quietly and think about what I would like to do with it and add to it. The first thoughts that pop into my head usually stays there, if they are allowed to. Then I start to discuss with my producer and the people around me. 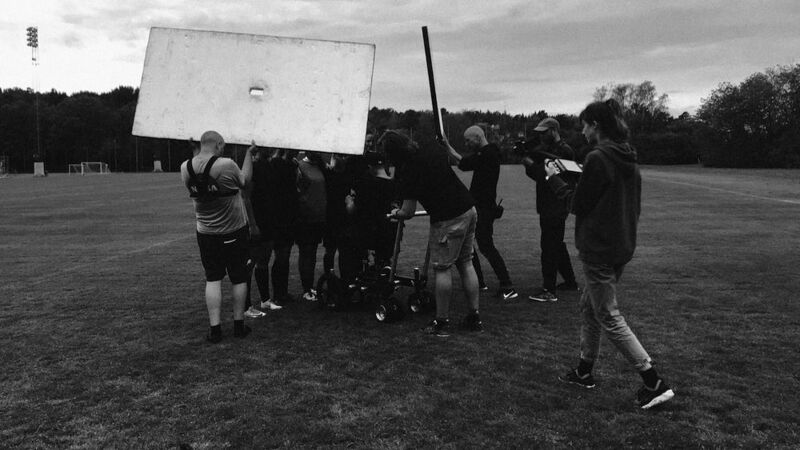 The film is about “Number Ten,” a 1,000,000 SEK scholarship with the aim to celebrate people that take Swedish football to the next level, in their own little ways, on or off the pitch. It’s a beautiful initiative and opportunity. I wanted to focus on telling stories about these people in everyday situations, getting really close to reality with our characters and in our environments so that people can relate and find inspiration to apply. The initial script from the agency is quite close to the result but there were more scenes at first. We had a close collaboration with the agency and great team work where we all got to say our ideas. I love when that happens. Together we killed our darlings and added/changed some scenes to make it more dynamic and emotional. What led you to make the aesthetic choices that you did for the spot (lighting, camera angles, etc)? We wanted to stay in the cinematic and beautiful “Volvo world,” but go a bit more rough and documentary, since this film is about football and the people behind it. I worked closely with the DOP, Hannes Isaksson. He is amazing and always has his focus entirely in the scene, even when he almost gets a football to the head. I’m always running after him – I can’t stand still when I’m directing, I always want to be close to the talent. I like when an image is not perfectly framed, sharp or planned, and Hannes has this organic way of moving within the scene that makes it so beautiful. Handheld with anamorphic lenses felt perfect for this film. We wanted to keep the light natural, but with an enhanced feel. Using cracker in some scenes for example; I love what it does to the light. We used existing light in the locations and worked from that, to make it feel authentic. For example, the big lights at the football court are so visually powerful, so we just had to turn them on and off, and boom: amazing light. How was the casting process for this spot? How did you go about working with the talent to capture the desired performances? We wanted to cast interesting characters that felt believable and not placed or too commercially coded. For some scenes, we even cast real friends, players, etc. I love that type of casting. In that way, you get moments that are not in the script, that just happen naturally and are usually more interesting. For some of the scenes where we cast actors, we let them play out the scenes at the casting and chose the ones that felt the most authentic. The teenager in the fitting room for example, she was so believable it didn’t feel like acting, it was just like she was playing herself. I am always very aware of the person I am directing – the most important thing for me is to make them feel comfortable. I let them know about the film and the scene, that it’s an important film and that they have a purpose in it. First, I let them improvise, then I give them small notes what they can think about. I think the best performances comes from inside. After all, we can all see when an actor’s real emotions shine through. I always think it’s a good idea to create a dialogue between the characters for the mood in the scene, even if there is no dialogue in the original script or end result. You never know what amazing thoughts and words you will get out of the actors. I always always record sound on my shoots for that reason. This spot combines two genres of advertising that women directors don’t always get the opportunity to shoot (eyeroll): sports and automotive. What are your favorite aspects about shooting both sports and automotive commercial work? I hope that this fact will change, and I think it’s about to. I don’t believe in focusing too much on what kind of ads women get and don’t get. I like to be identified as a director, and not a female director, when I am working. For example, when my production company is introducing me to an agency, I want them to say: “We have a new director, her name is Lina,” instead of, “We have a new female director, her name is Lina.” In social media, though, I use hashtags like #womendirectors and #femalefilmmakers to reach out and connect. I think it’s important for people to see that women together are breaking barriers every day! That’s why Free The Bid is so amazing – I come here all the time to find inspiration. I think if we start talking in a different way about it, choose our moments when we use the word “female director” wisely, and encourage the individual instead of the gender, we will get far. People will then keep it in the back of their minds, anyways, that it was a woman that directed that amazing car commercial, for example, until it becomes completely normalized and we can see each other from our skills instead of gender. That’s the final goal. I love the energy that shooting sports brings you, when you film a real team playing, for example. In this case, the teenage boys completely forgot about the camera and were in their natural mood. In that moment, it’s about capturing what is already there: the spirit, the adrenaline, the intimate small talks right after the game. In terms of shooting cars, I like when the car has a natural role in the scene and shooting it in an uncomplicated and simple way. There is something magic about a driving car in the rain, enhancing the sound of the tires on the road, street lights reflecting the hood. The things that makes you feel something. In this film, the car had a subtle role, but I would also love to direct a commercial that focuses more on the car, and experiment with the emotions that it could give people. Did this shoot pose any unique challenges for you as a director? Were there any on-set highlights? Every film is a new challenge; that’s what I love about this job. It should never be easy. This time it was to get into the world of football and to capture it in the right way. Every detail had to be authentic, otherwise people wouldn’t believe it. At the same time, we couldn’t show any logos etc, so we had to adjust the reality. We had fun discussions on set about how to make it look real when filling air into footballs, how to carry a goal in the right way or how to wear the socks when playing. The best highlight was the cast’s performance in all the scenes. I was truly impressed by them. We filmed “Locker Room Talk,” which was last years winner of the scholarship. They talked about gender equality in front of 15 teenage boys. It was amazing to see how they listened, and their smart reflections on the subject. I loved filming that, they forgot about the camera. The whole team was super concentrated and it felt like we were all at a lecture. Also, it was great when it started to rain heavily at the right moment for the drone shot of the boys game on the football field. It’s amazing how beautiful rain can be and how excited the whole team and agency got. Great – “it’s a wrap” – hugs for everyone. What are your favorite elements of the final film? I love the opening scene with the girl kicking ball at a garage at night. It’s been my favorite, since we found the location, but I think it was mostly about the girl. She was so real: she had been working out all day so she was exhausted for real and delivered real adrenaline. I also love the scene where a coach is comforting a teenage player in the fitting room. I love the lighting, location, styling, everything in that scene. They delivered amazing dialogue between them, they were so good and really got into the scene. I could make a short film just out of that, ha! And the portraits. Something special happens when the characters look straight into camera, you get their personality, it shines through in a magic way. What are some upcoming projects that we can look forward to from you? I always have lots of projects on my mind, in between commercial projects. I’m working on an idea for a short film that I’ve had for a while. It takes a lot of effort and time, and I think I’m ready for that now. I am also working on an art/fashion film that I am developing together with one of my favorite stylists, Rebecca Palmer. She is a genius. In conclusion, what advice would you give to aspiring filmmakers? Try to talk to people that don’t have the same references as you. For example, people that are not in the business. Challenge yourself and your thoughts. Have a close and honest relationship with your producer. Most things can be solved if you are creative and have the will. Also, producers usually have a lot of experience – use that, ask for creative input from them as well! This also applies to the team, DOP, Stylist, etc. I use my team to the fullest, and include them in the creative process. Be nice to other creatives around you, including directors from other production companies. I think directors should meet and support each other more, like over a coffee or lunch, not only on social media. Challenge the briefs that you get, in the way that feels good for you. It will be worth it on the day you get a job because you fought for your idea. You need to be passionate about the film you are making, or it will show. Make things that are you, from inside. Start filming and see what happens. Shut everything down and start to write. And if it’s hard to write, start with a moodboard with stills from films. It doesn’t have to make any sense. In the end, you can only make something that’s true to yourself. The reality for all artists is that it’s not easy. It’s hard work, performance anxiety, bidding, waiting, losing, winning. You have to love it and live it.